As I write this, I am camping by myself for the very first time. Flying solo, as it were, like Meriwether Lewis, Neil Armstrong, Butch Cassidy, and other classic American frontiersmen who ventured forth to become men without fathers to pitch the tent or girlfriends to chop the firewood. My first impression of becoming a man is that tents really have come a long way since my childhood. 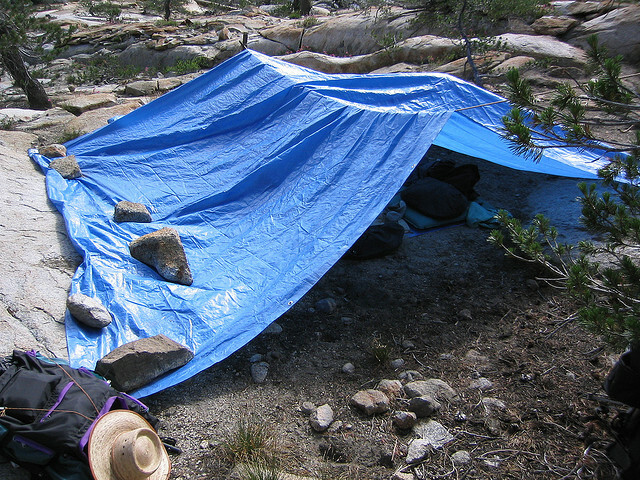 For instance, tents now have floors. They also promise on the packaging not to siphon rain right into your shoes. While giving tent setup an initial try, I found a lot of left-behind tent stakes. These stakes could be merely relics from simpler days, when campers torched their floorless tents rather than pack them out. But I know better. These stakes are all that remain of campers eaten by cougars. 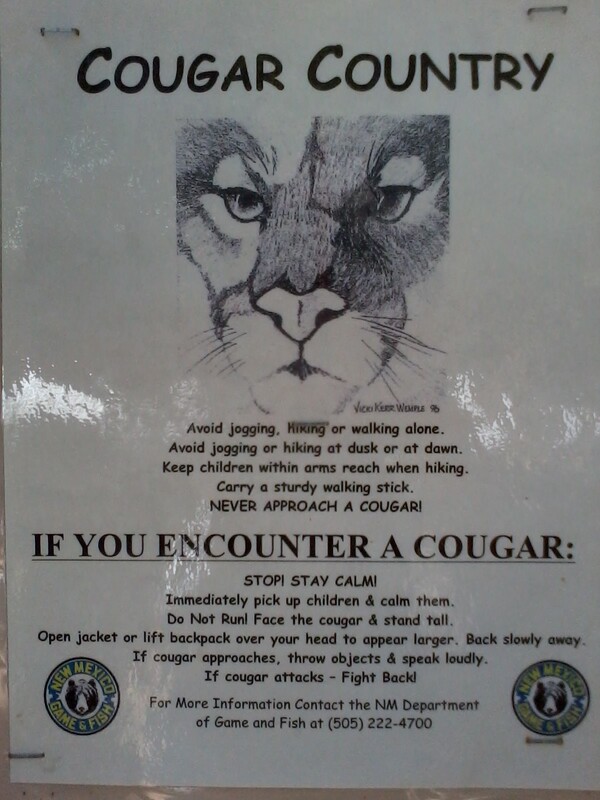 Cougars present a very real threat in this campground. The freshly laminated warning signs stapled to the vault toilet by the Department of Game & Fish describe how cougars want to bat me around like a mouse in a pinball machine. – Avoid jogging, hiking, or walking alone. – Avoid jogging or hiking at dusk or at dawn. – Carry a sturdy walking stick. – NEVER APPROACH A COUGAR! – Do Not Run! Face the cougar & stand tall. – If cougar approaches, throw objects & speak loudly. – If cougar attacks—Fight Back! Now, according to my imagination, a mountain lion is larger than the average housecat whose tiny claws I cannot remove from my clothing without gouging myself. Of course I won’t Fight Back. Are you kidding? I struggle to combat plastic shrink wrap packages. If a cougar attacks me, I plan to flop into a boring heap and hope that, before I regain consciousness, the cougar moves on to other feline activities, such as attacking itself or sleeping. You might think that only cowards faint instead of fighting back. But that’s not true. Cowards would read these warning signs and promptly return to town under the guise of fetching all the camping essentials they just realized they forgot. I am no coward. I will test my mettle without such frivolities as can openers or a pillow or breakfast. I will make do with what I brought, or do without. And I think I’ll be doing without, unless my phone magically discovers a signal out here so I can call the tent manufacturer or maybe my parents to walk me through putting this tent together before darkness blankets the forest which is already happening and there’s noises in the trees and no sign of the local ranger and I can’t even see what I’m writing anymore if you all discover this notebook after I die please tell everyone I loved them and I’m sorry about that unfortunate incident with the beans. I’m back and obviously not dead yet. In the end, I bucked up to the challenge. I worked up quite a macho sweat threading the tent poles through the tent pole sleeves. I correctly oriented the rainfly in less than five tries. Not to brag, but I even triple-pinned the tent zippers with all the extra stakes. 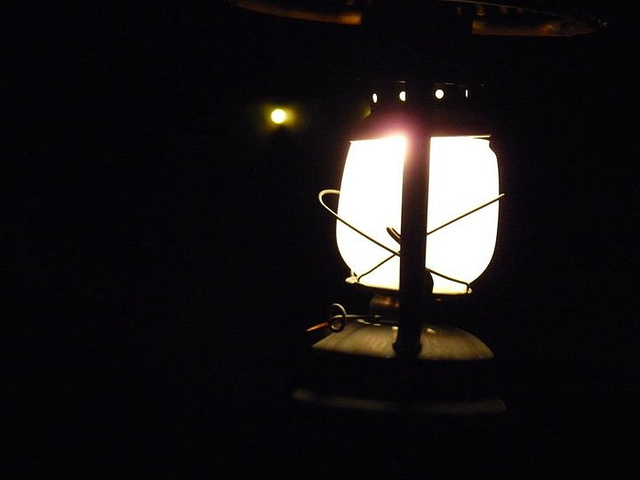 I’m admiring the whole installation as I write by lanternlight inside it. I have a big stick; I’m not moving; and I challenge any hungry cougar to get through this manly fort and take its chances with me. No, really. I’m not sure how to get out otherwise.